When he was seven, Will Lourcey founded the non-profit FROGs or Friends Reaching Our Goals. Since then, the organization has provided over 200,000 meals for the hungry and packed over 60,000 bags of food for children. Recently, his project “Score on Hunger” helped him become a LEAD360 finalist. Read on to find out more about his story. 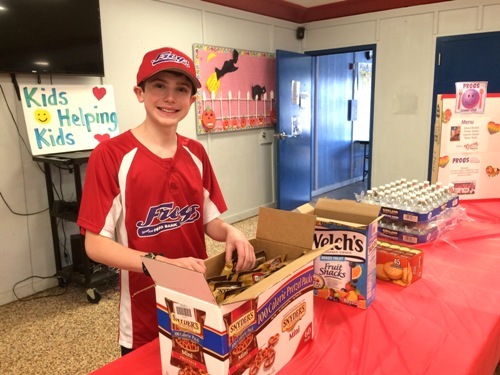 Will Lourcey handles snacks for a FROGs event. AK: How did you find out about LEAD360 and why did you apply? What was your reaction when you found out you were a finalist? WL: I found out about Lead360 through the Jefferson Awards and signed up for it. I was so excited when I was announced as a finalist because I knew this would be awesome for my project. AK: Could you tell us a bit more about FROGs and what inspired you to create it? When I was 7, I was riding home from a little league baseball game when I saw a man on a street corner holding a sign that read, “NEED A MEAL.” It made me sad inside and I knew I needed to ACT! I gathered friends to do something about it. I created the nonprofit FROGS, or Friends Reaching Our Goals. Our motto is “Having Fun While Helping Others” because we like to engage youth in community service via fun events. AK: How does FROGs reach out to the community and help provide meals to the hungry? Tell us about your various programs and how you have found sponsorship. WL: Our LEAD360-associated project is Score On Hunger, our first nationwide campaign where kids can recruit a sponsor to donate monetary or food donations. For every hit, goal, or point scored the donations go to a hunger-fighting charity of their choice. This is an awesome project because we inspire youth to combat hunger through sports. Another project of ours is the FROGS Dinner Club, where we partner with the Boys and Girls Clubs to provide a healthy meal to the youth at the club, and also engage them through a fun service project because we believe we all have the ability to make a difference. AK: What do you think is the solution to worldwide hunger and malnutrition? WL: The solution to hunger is through youth. Youth have the energy and passion to achieve whatever they desire. If we can channel that into solving hunger, imagine what we can achieve! This is what we do at the FROGs Dinner Club; we use food as a tool to break down ethnic and social barriers to unite youth as a force for good. There is nothing in the world that can stop a group of positive, united group of youth. AK: Outside of running FROGs, what other activities are you passionate about and enjoy doing? AK: Is there anyone who has helped you on this journey? Who and how did they assist you? WL: I have been heavily influenced and inspired by my family, friends, and the kids at the Boys and Girls Clubs because I see what a positive impact I am creating and it pushes me to go forward with my project. AK: So far, what do you view as your biggest achievements and / or successes? WL: So far, perhaps FROGs’ biggest success is the fact we have provided over 200,000 meals to the hungry in my community. We have also involved hundreds of youth all across my state to become engaged in community service. And through our newest project, Score On Hunger, we plan to help even more people! It’s going to be epic! AK: What has been the most challenging part of your journey so far and how have you sought to overcome it? WL: The most challenging part of this journey has been when I first started FROGs – I was seven, and was usually met by adults with underestimation and just “a little kid with big ideas.” However, when FROGS started expanding, adults saw the potential just one kid can have. I love to say “No matter how tall or small you are, you can make a big difference!” Overcoming doubt was one of the toughest challenges, but as soon as I overcame it, I was met with seriousness from adults. AK: If you could change one thing about this world, what would it be and why? WL: If I could change one thing in the world, I would make it where fresh, affordable food is accessible to everyone. Food insecurity is a massive problem in America, and this is mainly caused by food deserts, or areas where the civilian population lacks access to fresh affordable food. In the areas the FROGs Dinner Clubs serve, some kids only have access to convenience stores for food. We have heard reports that they eat (or more properly drink) Slurpees for breakfast. This is unacceptable because lacking food is not just an issue, but a social injustice. I would end childhood hunger. Our country can do better than what we are doing now. WL: I like to encourage youth who want to start their own organizations to “See A Need, Make A Plan, Gather Friends, and Change The World!” If you follow this formula and take on every situation with a positive attitude, there is nothing you cannot achieve! WL: To get involved with Score on Hunger, please visit their website. It’s an awesome way to make maximum impact and help change the lives of people living in your community.